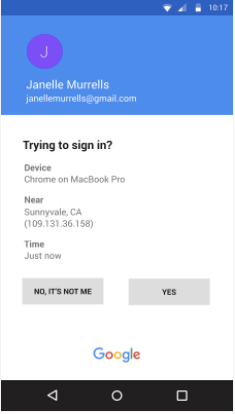 phone prompts for 2-Step Verification, giving users another option to keep their accounts safe. Starting this week, users who have opted into receiving phone prompts for 2-SV will notice improvements to the notifications they get when trying to sign in. For instance, when available, they’ll see additional details about the sign-in request, like when and where it was made. These improved prompts will appear on both Android and iOS devices. In June 2016, we introduced phone prompts for 2-Step Verification, giving users another option to keep their accounts safe. Starting this week, users who have opted into receiving phone prompts for 2-SV will notice improvements to the notifications they get when trying to sign in. For instance, when available, they’ll see additional details about the sign-in request, like when and where it was made. These improved prompts will appear on both Android and iOS devices.